OTTAWA, Canada -- We are helping Ukraine, supposedly. Canada and the United States have pledged large sums of money in support of the battle against the Russian-backed incursion. But there’s one place you won’t see any of our help appearing: the eastern Ukrainian battlefield. Some refer to a “Western-armed” and “Western-trained” Ukrainian military, but in truth, there has been no sign to date of any Western armaments or training at all. On the contrary, Ukraine’s ill-trained, inexperienced military has tried to fight the Russian-backed incursion using patched-together Soviet-era arms under primitive conditions – sleeping in camping tents, eating donated food, receiving salaries of $200 a month and using Nokia phones to communicate on the battlefield. They have done this with considerable incompetence – aim so poor that their mortars struck cities and killed hundreds of civilians, turning public opinion against them this summer until they were routed in a late-August slaughter by Russian forces, after which the public mood turned to pity. This has not been a Western-armed campaign. This should be a good moment to help Ukraine. The population is united and pro-Western, the leadership is moderate and democratic and the cause is a principled one. But while Canada has pledged more than $200-million, it has sent just three planeloads of non-lethal equipment. The United States has pledged $70-million in military aid, which includes “rations, radios, concertina wire, first-aid kits and limited supplies of body armour, but no arms,” according to The New York Times. The Ukrainians want drones, encrypted radios, heat-seeking missiles and anti-aircraft guns, but both Washington and Ottawa are balking. They also want money, a lot more money, but this is also not forthcoming in any significant quantity. Despite pledges, very little money has reached Kiev. Ukraine’s ambassador to Canada, Vadym Prystaiko, spent the summer complaining about this. In late July, four months after Prime Minister Stephen Harper made his $200-million pledge, he told The Globe and Mail that absolutely nothing had arrived. A week later, Ottawa sent a planeload of equipment. At the end of August, he said there had been no “real” military support. But it’s unlikely to be arriving quickly, for a reason that officials involved with the Ukraine operation have repeatedly told me, and that anyone with experience in Ukraine will recognize. The West has given Ukraine hundreds of millions of dollars over the past 24 years, and very little of it has reached anyone. It’s an institutional problem that has persisted across six governments and two revolutions. When the United States gave 300,000 meals of MRE rations to the Ukrainian military in April, it immediately found them being sold by Kiev businessmen on eBay-type auction sites. There’s a genuine fear in Ottawa that larger objects and sums of money will be subject to the same kind of vanishing act. The Ukrainian military is the ultimate victim of this institutional corruption. I spoke this week with Colonel Chris Corrigan, a retired Canadian officer who made seven trips to Ukraine between 2008 and 2011 to provide training and assistance to the Ukrainian military on behalf of the U.S.-based Center for Civil-Military Relations. “Their system was still Soviet – nothing had changed… and they really needed help. It was more than just adopting doctrine, it was changing their culture … their military is still a gerontocracy, not a meritocracy,” said Col. Corrigan, who is now executive director of the Royal Canadian Military Institute. “There was certainly no evidence of any military equipment coming to them – it was old stuff that they were trying to keep working,” he said. It was a top-down military – everything was directed from above. And the money seemed to disappear there, too. The problem became far worse under erstwhile president Viktor Yanukovych, who allowed generals to become profiteers. In July, after Western officials candidly told his successor, Petro Poroshenko, that aid won’t be delivered as long as it is likely to get stolen, the new President purged some of the military’s top commanders, using a parliamentary speech to denounce the “complete collapse” of his government’s ability to supply the military. The shakeup was welcomed, allowing some aid to flow. 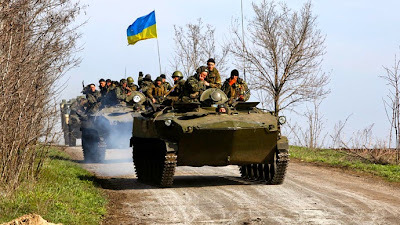 “Those calling for immediate, unconditional shipments of lethal weaponry and other military assistance may think they’re doing Ukraine a favour by rushing in aid at its hour of need,” Sarah Chayes of the Carnegie Endowment for International Peace has noted. But “most of the Yanukovich-era corrupt networks remain in place.